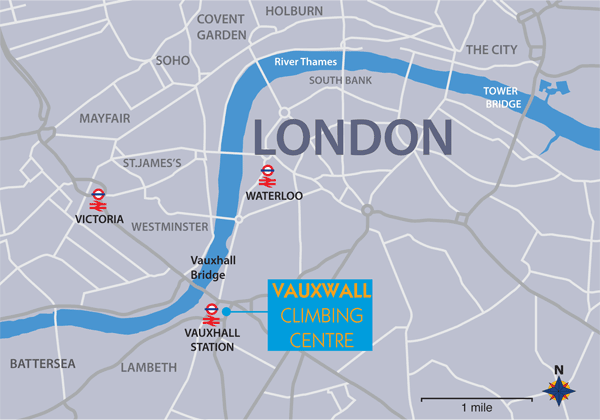 VauxWall Climbing Centre is the climbing wall for Central London; the only dedicated climbing wall in Fare Zone 1 and just 2 minutes walk from Vauxhall Station, most of it under cover. We are well served by public transport being next to Vauxhall Station, both National Rail and the tube, and next to Vauxhall Bus Station. There is secure bike parking and Santander Cycles 2 minutes from our door, and pay and display parking on several streets nearby. When arriving by train or bus, go through the subway (the one with the secure cycle parking) next to the exit to Vauxhall Station. Exit the subway and turn right up South Lambeth Road and in 50 metres you arrive at VauxWall. We have a café on site serving drinks and snacks but if you need something more substantial, there’s Dirty Burger and Nando’s just down the street from us; and a Sainsbury’s Local next to the station. Vauxhall Station is on the Victoria Line. We are 6 minutes on the tube from Victoria station. (Fare Zone 1). Check travel times from Underground Stations to Vauxhall here. Click here for an interactive London Underground map and how to get to Vauxhall Station from where you are. Vauxhall Station is easy to get to from South West London and beyond being served by South West Trains. We are one stop from London Waterloo station (South West Trains London terminus). Vauxhall Bus Station is served by London Buses routes 2, 36 (24 hour service), 77, 87, 88 (24 hour service), 156, 185, 196, 344 (24 hour service), 360, 436 and Night Bus routes N2, N87, N136. If you are on your own bike there is secure Cycle Parking provided by Transport of London in the subway next to exit of Vauxhall Station. There is no cycle storage inside the centre. There is a Santander Cycle Hire in the subway at Kennington Lane Rail Bridge (just by the Royal Vauxhall Tavern) and at Vauxhall Cross Bus Station, 2 minutes from us.